While people from far and wide are anxious to try and help the victims affected by Monday’s disastrous tornado in Moore, some of Lawton’s finest have already been there and are waiting for their call to go back again. 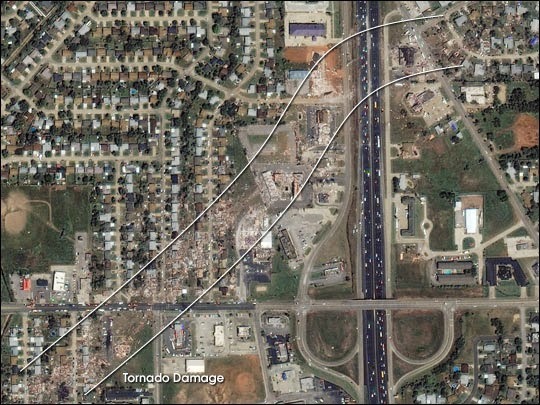 According to various wire reports, the tornado resulted in over 200 injuries or fatalities and left a path of destruction about a mile wide and nearly 20 miles long as it made its trip across the Moore area Monday afternoon. By 5 p.m., 43 firefighters with the Lawton Fire Department were already at the disaster area or enroute with trailers of tools to assist crews with the debris and rubble, which LFD Maj. Daryl Nobis said is unlike anything he has ever seen before. “You just couldn’t tell where one (house) started and another ended,” Nobis said of the disaster debris. The assistance teams stayed for about 12-14 hours, returning to Lawton around 5 a.m. Tuesday. Nobis said the firefighters divided up into four smaller groups of about 10 men, when they arrived. When they first arrived , crews were asked to respond to the area of of Southwest 4th Street and Telephone Road in order to clear various buildings near a heavily-damaged area, which included the Warren Theatre, the Moore Medical Center, a bowling alley, post office and bank among the structures. An image of cars stacked into a small mountain of twisted metal at the medical center was broadcast during evening newscasts across the country. Nobis said Lawton crews helped dig through that pile to ensure nobody was inside. Nobis said the bowling alley had luckily closed at 3 p.m., but he still was part of a team that crawled through tunnels in the debris to ensure nobody was there. While there always remains a distant possibility some nook or tiny cranny remains unchecked, he said he was fairly confident nobody was inside. After their initial responses in the business areas, Nobis said the men divided their resources and sent half the teams to residential areas east of I-40 and west of I-40 to begin searching for survivors. With the help of an industrial digger and lifter, they literally moved from pile to pile, digging down until they found a foundation or dirt and continued to search for those trapped in debris or shelters. In their time at Moore, Nobis said the Lawton Fire Department was able to help clear about two square miles of the destruction path, digging to the bottom of probably 100 homes. Nobis said he predicts many disheartening sights for rescue crews continuing excavation efforts in the coming days. The firefighter said the neighborhood west of the theatre was completely gone, and many of the people found in coming days might be from that area. The overnight rescue efforts, while accompanied by some disappointing discoveries, primarily ended happily, though. Nobis said a neat thing that he was able to be a part of was finding one woman’s iPhone. In trying to figure out the owner, he said he began going through the contact list and ended up speaking with the woman’s daughter. Nobis said he has been in contact with the woman and will get it back to her as soon as possible. Lawton fire crews came across many faces of people very happy to see them after they had freed them from barricaded shelters, and they may be called to return in coming weeks. “Everybody always goes at first to help, but now we have other departments on a list for rotating schedules,” Nobis said. Now, crews from all over the state can continue the rescue through concentrated efforts and assignments as needed. Following 9/11, the state of Oklahoma was divided into seven FEMA disaster areas, and crews expanded their training in all areas of search and rescue while simultaneously obtaining updated tools and equipment. Firefighters had previously trained in building rescue techniques, and Nobis said LFD firefighters have previously offered help after the Oklahoma City bombing as well as the 1999 tornado in Moore. The department now has over 60 firefighters who are trained in technical rescue techniques, including trench collapses, swift water rescues and building collapses. When Monday’s disaster struck, however, the Lawton Fire Department—which is part of FEMA’s task force covering 54 counties south of I-40—was glad to send more firefighters than any other mutual aid response team to help the victims out of shelters and search for people in damaged buildings. “Kudos really go to our city fathers to be able to send that kind of support,” Nobis said. Volunteer firefighters from Elgin, ‍Cove ‍Acres, Kirk’s Ambulance and Memorial Hospital also accompanied Comanche County Emergency Management to Moore overnight as part of a local search and rescue team. They also worked the business and residential area that Lawton firefighters were in.